The John Deere Model A was the first actual row-crop tractor of the company, and was produced from 1934 to 1952. The A had a few new features, including an adjustable rear axle on most versions, a completely hydraulic power lift system, and a center-line hitch. It also had two 14-inch plows. Not only was the Model A the first technical row-crop tractor for John Deere, but it was the first John Deere released with rubber tires. Over the years, the two-wheel drive Model A had multiple upgrades, such as an optional electric start, a six-speed transmission, and more powerful engines. When the A was first released, it was 3,783 pounds, 10.33 feet long, 6.92 feet wide, and five feet tall. At the end of the Model A’s run, the weight had been increased to 5,228 pounds. The length had gained ten inches, making it 11.17 feet long. The original engine, used until 1940, was a horizontal, distillate-fuel engine with two cylinders and four valves. The A had a bore and stroke of 5.50×6.50 inches, a compression ratio of 4.45:1, and a displacement of 309ci. It had a manual starter at the flywheel until the new engine was released with an optional electric start. After the engine upgrades, the Model A had a twin-cylinder gasoline engine that had a bore and stroke of 5.50×6.75 inches, a compression ratio of 5.60:1, and a displacement of 321ci. 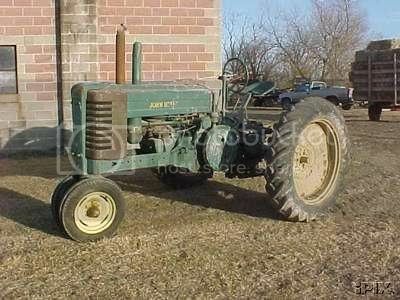 When the John Deere A was first on the market, it had a four forward-speed transmission with one reverse speed. In 1941, however, the transmission got upgraded to a six forward-speed transmission with one reverse speed. In 1934, the A was tested and had a Belt power of 24.71hp, PTO power of 23.63hp, max Drawbar power of 18.72hp, and a maximum Drawbar pull of 2,923 pounds. Later in 1947, with the six-speed transmission, the A had a maximum Belt power of 38.02hp, PTO power of 33.8hp, maximum Drawbar power of 34.14hp, and a maximum Drawbar pull of 4,045 pounds.
? how do i get a hold of the seller of the model a john Deere tractor , I think that it should be worth at least $4500.00 in us funds. If the seller would fax me, Then i could make contact with him, If he gives me his contact info thank you. Barry, just click on the link to find the information. Thanks! I have a full set of “A” cultivators complete with the planters. I would like to sell them. Need rear axles for a late John Deere Model A.
Hello, I was wondering if any of the JD A tractors had a wide front end? I have an old A and would like to have the wide axle. My A has 12.4×42 tires was this optional? I see most have 38 in tires. Thanks, Brian. Looking for an older Model A John Deere (1946—47) somewhere in Washington state. Please send pictures and price to::: P.O.Box 30 in Montesano, Wa. 98563. Looking for my Grandfather’s 1947 A Model with the wide front end. Sold in the Aberdeen, SD area in The 1980s. Email leads. Farrjunk Thanks. Farrjunk@kywimax.com. Looking for a good restored Model A, reliable mechanicals, decent tin (green, not brown) but not necessarily parade-ready. Last model, 1947-1952. Six-speed transmission, 12-volt, three-point hitch, Roll-o-matic front end. Destination Knoxville Tennessee, can pick up anywhere within 200 miles. got the governor gear timing mark lined up with the cam gear, and mag firing at the right time, but my problem is no oil getting to the rocker arms (or tappets). Inside the gov housing is a place where oil pools, and if/when it fills so far, its suppose to run down a pipe to the valve cover and drip on the tappets, but its not, So I have the block back off, crankcase cover off, rubber plugs in the crank, so I can rotate the flywheel to watch the oil distribution. and saw no oil on the crank gear, cam gear, or gov gear or gov weights. Had the fan driveshaft out, and rotating the flywheel aprox 500 rpms with a portable grinder that I put a 6″rubber tire on, observed most of the oil flow coming out of a 1/2″ hole next to the gear that drives the fan gear, but still no oil collecting in the “cup” (part of the casting on the inside of the gov housing) to run down to the head. Yes, I did have oil pressure, around 15psi. If anybody knows how oil is suppose to get to the camshaft, cam gear, and gov weights that would sling it into the “cup”, please advise. JD dealer was no help. they couldn’t even explain the usage of lead washers on the head bolts! I figure they must be there as a seal, since the studs go into the water jacket. my dad passed away in JAN. and I got his 1943 A after he died and found out it had from factory 4-24 frt. steel wheels and 6-50 rear steel wheels on it. My question is where can I find them. Please email me ANY info.